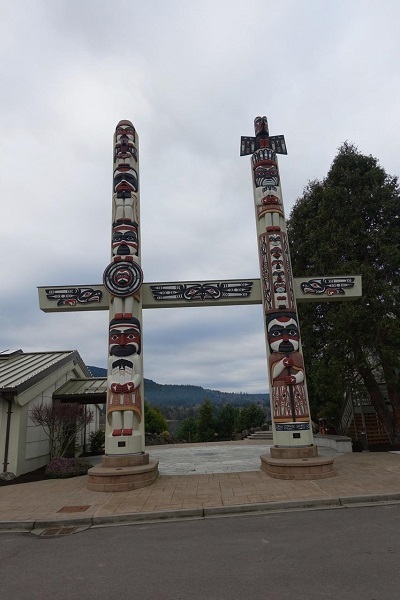 SPGC journeyed to the Jamestown S’Klallam Tribal Campus to view the many totem poles, carvings and works of art on display in the Tribal Library, Administration Building and gift shop. The highlight was the House Of Myths Carving Shed where ancient old growth cedar trees are turned into the majestic totem poles that are on display throughout the Olympic Peninsula. Our Historian, Priscilla Hudson, introduced Dale Faustich, the head carver and designer, who is currently working on the S’Klallam Picnic Shelter that will replace the canoe shelter that graced Pioneer Memorial Park for so many years. The handmade tools were on display and Mr. Faustich demonstrated their use for club members. The notch along the back of the trees minimizes the cracking and stress on the logs. It takes from 6 weeks to 6 months to carve a totem, costing from $2500-$5000 per lineal foot.